It's one of the world's most exhilarating canoe races, and one of the most scenic. Every August, hundreds of canoeists from around the world head for the Picos De Europa mountains in northern Spain to descend the Sella river to the coast at the Bay of Biscay. It's a 19-kilometre descent from the mountain trailhead town of Arriondas to the port of Ribadesella through winding curves, over rapids, negotiating numerous pebbly sandbanks. It's both a race and a fiesta. Competitors range from Olympic champions to local charity fund-raisers. The event ends in a huge party by the river in Ribadesella. Locals and visitors have been making the descent for over 80 years, with the popularity growing every year, and international teams participating since the 1950s. For many visitors, the canoe descent is an aquatic equivalent of running with the bulls in Pamplona, an event that occurs a month earlier. The canoe descent is a little less dangerous, much more enjoyable, and doesn't involve any harm to animals (unless you count the occasional stunned fish). 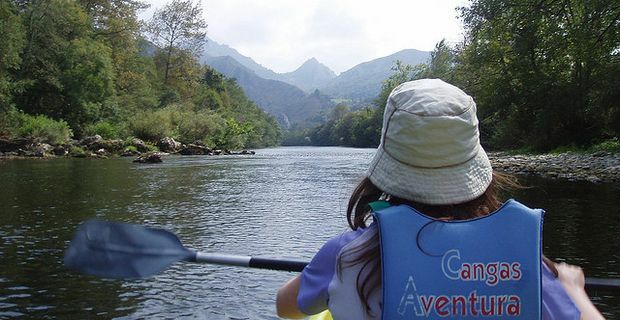 If actual race day seems a little too hectic, there are numerous canoe and kayak companies in Arriondas offering boat hire for a day on the river throughout the summer. It's an ideal family activity as the river is rarely more than a couple of feet deep. Companies supply safety equipment, life-jacket and a watertight barrel to store your valuables and lunch. There is a midway point about eight kilometres downriver where a makeshift bar offers cold drinks and sandwiches. There is one guarantee: you are going to get wet. In the summer months, the temperatures in the region are usually hovering around the high twenties, so a little moisture is not a problem. Boat company mini-buses are waiting at Ribadesella to take you back to the mountains.